Spectra fibre woven into superbraid is the ultimate fishing line for both kite fishing and deepwater jigging for hapuku and bass. Spectra is around one third the diameter of nylon for the same breaking strain. This means a kitefisher using a pocket sled or flexiwing fishing kite rig can get three times as much line on their fishing reel and fish three times as far offshore. When using spectra lines kite fishers using dropper rigs reduce the work the kite has to do to tow the rig out and keep the line clear of the water by two thirds. This is because the superbraid has only one third of the windage and weight of conventional monofilament or dacron fishing lines. Spectra superbraid is also kinder to fishing reels as it only has a stretch factor of around 1% while nylon can have a stretch factor of up to 30% (even dacron fishing line has a 10% stretch factor). When using more conventional fishing methods, such as deepwater fishing from boats for bass, grouper (hapuka) or other deepwater species, bites can easily be felt even at great depths because of the incredibly low stretch of spectra and its ability to transfer every detail of the bite instantly to the angler. It also works the other way round, those jigging in very deep water can easily impart real action to the jig or lure even at depths down to 200 metres and beyond. Obviously when the angler strikes the strike is instantly and positively transmitted to the point of the hook ensuring maximum penetration and fewer missed strikes. Probably the biggest benefit to deepwater rod and reel fishers is the fact that the spectra line is so thin for it's breaking strain you will only need a third of the amount of lead weight to hold the bottom compared to those who use nylon fishing lines. So why don't more people use superbraids for fishing? The answer to that is simple, up until now spectra superbraids have been prohibitively expensive. Paul's Fishing Kites now supplies top quality spectra superbraid. After extensive negotiations with the manufacturer, we are now able to supply high quality spectra at NZ's lowest prices direct to the public. During a fishing trip to Uretiti Beach with David Billings early summer we got some snapper to 1.5kg plus some gurnard. While on a kitefishing trip at Uretiti Beach early summer with David Billings, I got a phone call from Craig Jefferies, who owns the local Office or watering hole. David and I were pulling in some nice snapper and gurnard and Craig said that he was really keen to see how this kite fishing system works. So, on his arrival at the beach, we did our last set for the day and Craig was very impressed with the whole concept. 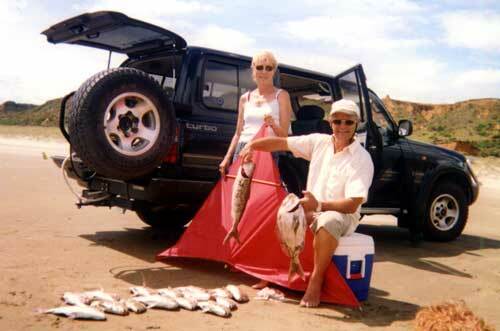 It was actually the same day that Paul and Peggy did their beach demo and caught some good snapper and gurnard. Craig asked me if I would make him a winch system the same as mine, I agreed, and after a bit of hunting down of bits and pieces he ended up with a motorised winch. Several weeks passed before Craig had a spare day off to try the system out. Thursday, January 29th there was a north easterly wind of 15 knots so we headed out to the west coast. There was less than a one metre swell and minor breakers rolling in so it was no sweat to take out the 25 hooks with his new Nighthawk kite. Using a combination of salted mullet and squid bait, our first set returned two snapper and one kahawai. There was very little rip during the second set and the kite went straight out. With the tide three quarters in we saw the best catch of the day. Craig was over the moon and couldn't believe his luck, the line was full of snapper. 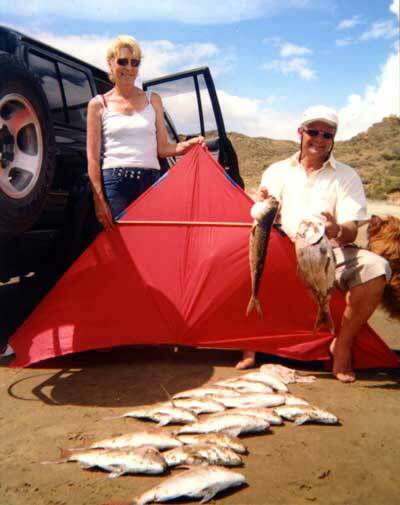 Craig and Moria Jefferies' were delighted as this was their first time out kitefishing with their gear. Craig's now has a new hobby and can't wait to do it again. Many of you will know Geoff Preston by the many great reports and photos of big snapper sent in from Mokau Beach. Geoff is a very experienced kitefisher and has caught in excess of twenty snapper over 20lb since living in Mokau. Geoff is opening a store and will be the local supplier of kitefishing and longline products. He writes: It's all good news. As from mid February I will be an agent for Paul's Fishing Kites. I have a small shop here in Mokau which I have converted for supplying fishing products. Along with selling the products, I would like to encourage people who are maybe considering getting into kitefishing to come to Mokau for demonstrations and techniques of using kitefishing rigs. We have 5 kilometer of open beach between Mokau and the Awakino river, and with a short row across the river we have about the same length of beach on the other side. All excellent fishing. My good friend and fishing buddy, Steve McKewen of Stratford, has a great bach overlooking the Mokau river and he is offering accommodation for a small fee of just $15.00 per person per night for those of who may want to come and stay for a few days. If you want to attend one of Geoff's kitefishing demonstrations, have any questions about kitefishing, or would just like to know what the wind or sea conditions are on the day, please feel free to phone Geoff on 06-752-9780. Olsen recently sent in these two pics from his kitefishing trip to 90 Mile Beach. 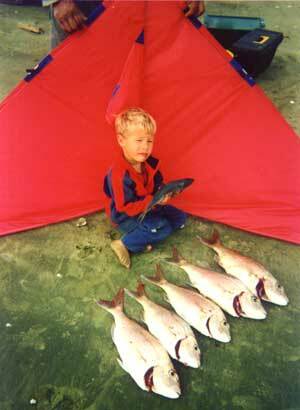 Right: A great catch of snapper taken while fishing over Easter weekend, 2003 using a bottom longline rig. John Pothan reported last week on the latest kahawai fishing contest held at Porangahau Beach on February 7th. 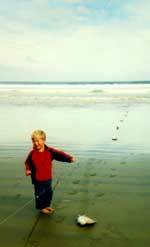 Fishing times were held from 8:00am to 4:00pm and included surf casting, kites and kontiki fishing methods. Despite a 65 knot westerly, 180 entrants wound up weighing in just over 100 kahawai for the day. The winning kahawai weighed in at 1.46kg. One snapper, for which there were no prizes, was also weighed in at 7.5kg. John reported that it was a very successful contest and there was shoulder room only on the beach. More than 300 people turned out for the prize giving of over $2000.00 worth of prizes which were awarded. Prizes included rods and reels from Kilwell and a range of kites from Paul's Fishing Kites. John plans to hold another fishing contest mid March, once he's completed the clean up from the recent floods. We'll let you know the details as they become available. Last Sunday I had a call from our friends who are very experienced kite fishers asking us if we fancied going kite fishing with them. My husband and I are British and never heard of kite fishing till coming to NZ so we decided to give it a go. We are both keen landbased fishers and like nothing better than finding good areas to rock hop. So myself, my husband and his 73 year old mother hopped into the 4x4 and followed our friends to a Te Arai Point. Beach near Mangawhai. We arrived at this beautiful beach and drove to get to our spot...and watched intently as this kite was expertly launched into the air with 20 bits of bait hanging from it. So we watched, open mouthed, until just about all of the 2000 meters of line was gone. At this point my husband decided to put a surf caster out. He is quite good and managed to get out around 180 meters of line. We waited, re-baited the hook and not even a bite. Then our friends decided it was time to bring in the kite. We all helped bring it in, that was the hard part. Then, emerging from the sea, were 6 beautiful snapper and we could not believe our eyes. It was the most fantastic experience. After re-baiting the hooks on the kite we decided to dismantle out surf casters and put them back in the truck. Why put out one line with one bait 180 meters and catch bugger all?? Well after putting the kite out another three times we drove home with a good catch, sunburned faces and a contented feeling. I think my mother in law really summed up the day well when she said "I feel so happy, like I have really achieved something and I contributed to the fishing experience. When can we buy one?" The fish were put into the freezer and all three of us huddled around the computer reading avidly your website. We will buy one tomorrow. It's the mother in laws birthday on Friday and all she wants to do is go kite fishing. I have visions of her flying home with extra luggage because she wants to take one back to Wales with her, and all the old ladies dragging the line back in trying to catch Cod. I think that the rods may become redundant now, don't you? On the 22nd of February I ran out two sets with my Paul's bottom longline rig towed out with a torpedo. I decided to do a night fish over the full tide which was at around 11:00pm. With a light south/southwest wind I baited up my 25 Target Hooks with mullet and let it rip. I put out my first set at 8:30pm on the incoming tide and left it out for one hour. The mainline went to around 500-600 meters offshore. This first set resulted in 10 great snapper ranging between 2 to 4lbs each. Setting out another 25 hooks and again leaving it for an hour, I wound up with another eight snapper. There was a great southwest wind blowing on February 22nd. I got my kite heading straight out, with a slight tack, but once the bottle hit the water the rip dragged it off to the right about 45 degrees. I pulled it all back in and put the skyhook on which gave me a slightly better angle and with the rip running it held at around 15 degrees off straight. The only problem then was pulling it back in from 1000 meters offshore, with the skyhook on as well it was pulling like a bulldozer. The one snapper I caught was about 35cm long and I had one floating bead trace broken off. I have lost at least four floating bead traces to bite offs in the last few months and several of the other beads have teeth marks in them! Do the fish actually attack the floating bead before having a go at the bait?. Editors Note: From the reports we have received over the last few months from fishers using the Floating Bead Traces, it sounds like snapper simply can't resist them! Fishing from a kayak last Sunday, I ran one set using the 65kg dropper rig hook section and dropper line. Baiting up 19 hooks with mullet I gave the gear a soak time of around half an hour. The weather was nice, except for when the squalls came through. I wound up with two pan size snapper and two small sting rays. An easterly storm is brewing and anywhere on the west coast should be ideal for those with good strong wind kites over the weekend. Flexiwing kites and super kites are recommended for winds over 45 knots. Make sure you have good quality 10 or 12 mm tawa dowels in case it turns into a full gale. Peg and I hope to do a demo at Muriwai Beach on Sunday if it's not pouring with rain, keep an eye on your inbox for details by email on exactly where and when on Saturday afternoon. If you wish to be notified of exactly where and when our next kitefishing demonstration will be held you can subscribe here now to be notified of the details by email.